I have to second the Aint it Cool team: Remaking the recent Swedish horror classic 'Let the Right One In' is unnecessary, fraught with disaster and just a Really Bad Idea. Do yourself a favor and let yourself be hypnotized by this icy tale of innocence and blood in its original version - the DVD even has a dubbed version if you just can't hack subtitles. 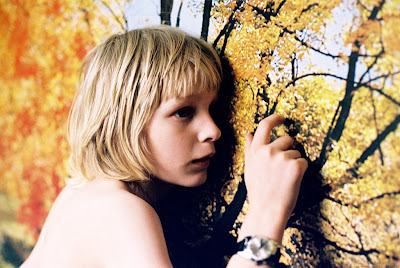 Let the Right One In is easily the best Vampire movie I've seen in years. If you haven't seen it yet you're missing out. Set in the snowy closed in world of a Swedish housing estate in the mid 80's, we are introduced to Oskar, a slight, shy 12 year old bullied by his peers and ignored by his parents, who have less presence in this film than the adults in a Charlie Brown cartoon. They're there to provide the minimum basics of parenting while withholding any real involvement. Oskar frankly acts like a budding serial killer as he fantasises about stabbing his enemies and making them 'squeal like a pig!' But mostly he just seems intensely isolated. And then there's Eli, who only comes out at night, wandering through the Swedish winter in bare feet. Eli is 12 too. But Eli has been 12 for very long time. The two meet and form a careful but quickly all-encompassing bond in the silent emptiness of winter darkness in abandoned public spaces, playgrounds under street lights and barren apartments. They do only what they have to. Another amazing thing about this movie: It's about real kids. Not little adults spouting dialogue, not kids as adults mythologize them, but real affectless kids, free of ironic detachment or hip cynical humor, free of all but the clumsiest most revealing attempts at childish artifice. Real human child behavior in movies is rare enough to be a jolt when you see it. It's also a rare thing when a movie comes along and pulls you into its world, against your will even. 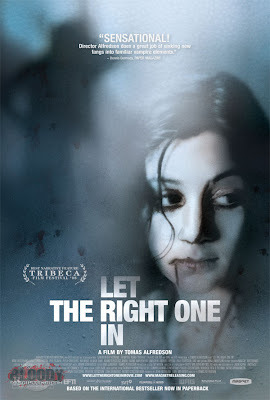 Let the Right One In is a masterful example of sparse but immersive film making that treats its characters and its audience with respect.